While we were in Paris this June, we took a trip to Claude Monet's house and gardens in Giverny, where he painted his lovely and iconic water lilies. We picked the perfect time of year as all of the gardens were in glorious, full bloom. After visiting the gardens and house along with a zillion adorable 5-year olds on school holiday, we had a great lunch of an artichoke salad and rose wine in the garden of nearby Ancien Hotel Baudy. Luckily for us, after we returned to Paris, we were able to view Monet's water lilies in the round at the Musee de L'Orangerie, where Monet designed and painted a space he donated to Parisians as a refuge for peaceful meditaion in the midst of what a flowering aquarium must be like. He focused on the changing qualities of natural light in his Giverny garden. The eight panels in two rooms evoke the passing of the hours from sunrise in the east to sunset in the west. With no horizon to orient the viewer, the elements-water, air, sky, earth-seem to merge in a compostion without perspective, where the water lillies create the illusion of an endless whole, of water without horizon and without shore. Wow! 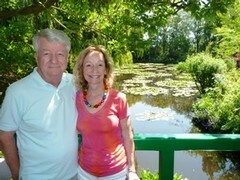 Ed and I very recently returned from a Danube River cruise, which started out in Budapest. There, we tasted the best wines of our whole trip (which surprisingly included Paris, which we visited after the cruise). 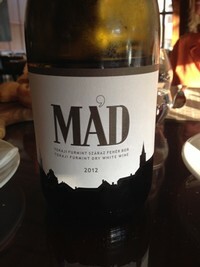 At the Four Seasons Hotel Gresham Palace, in Budapest, we had our personal favorite-- a dry white wine called MAD-- made from a grape varietal called furmint. Furmint is a grape varietal most famously associated with Hungary's famous, sweet Tokaji wines. The Tokaji region and its wine are held in such esteem in Hungary that the Hungarian national anthem thanks God that Tokaj szőlővesszein nektárt csepegtettél (‘into the vineyards of Tokaj you dripped sweet nectar’). We also took a wine tasting tour of the Etyek wine region, just outside of Budapest. We visited three wineries: Hernyak Estate (Pinot Noir and Sauvignon Blanc); Zarandok Pince (Chardonnay, Pinot Gris); and Gyula Oroz (Pinot Noir and Chardonnay/Sauvignon Blanc); where we also had dinner. 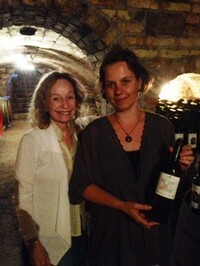 Our favorite from that area was a Pinot Gris called Bernadette, which we tasted in its cave. That's Bernadette and me in the photo. After boarding our cruise, we arranged a wine tasting dinner with fellow cruisers/wine lovers, to which we contributed our very own 2010 Diamond Mountain Cabernet Sauvignon--everyone's favorite. The 34th annual Auction Napa Valley, which was just held from June 4-7, broke its record for a second year in a row by raising $18.7 million for Napa Valley community health and children's education nonprofit organizations. The auction, which is put on by the Napa Valley Vintners (NVV), a non-profit trade association, lures wine and food lovers from over the world to beautiful Napa Valley to drink the best wines in the world, eat scrumptious food prepared by world-renouned chefs and bid on the finest of wines and breathtaking experiences, donated by generous NVV members, through both live, barrel, and silent e-auctions. 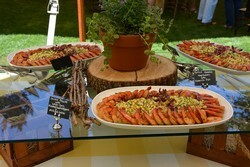 On Thursday, June 5, NVV members opened their homes to attendees with casual dinners all over the valley, such as Alpha Omega's succulent pig roast. On Friday, June 6, the Barrel Auction and the Marketplace, where Napa vintners, such as Ed and I, poured great wines and Napa restauranteurs provided delicious tastes of their food, were held at the recently-remodled Charles Krug Winery. Ed and I (with help from daughter Kelly and son-in-law Jeff) poured our 2010 Diamond Mountain Cabernet Sauvignon for attendees who loved it. On Saturday, June 7, in advance of the live auction, a lunch was served at Meadowood prepared by Napa Valley rock-star chefs Stephen Barber, Michael Chiarello, Curtis Di Fede, Thomas Keller, Cindy Pawlcyn, Richard Reddington, Brandon Sharp and partners Hiro Sone and Lissa Douman and, once the auction bidding ended, a luscious meal was created by 3-Michelin-starred chef of Meadowood's The Restaurant, Christopher Kostow. The theme of of this year's auction, was "Sweet Home Napa Valley," and the vintner's association really showcased what a sweet place it is to live and produce great wines in Napa Valley. View more photos and videos here. On Wednesday morning, June 4, the Napa Vintners' Association (NVV) lauched its theme of "Sweet Home Napa Valley" for its 2014 Auction Napa Valley at a luncheon held at Meadowood, in St. Helena. Not only were a tremendous number of NVV members in attendance but, at each table was a representative from one of the many Napa Valley non-profits, which would be recipients of the proceeds of the rest of the week's Auction Napa Valley events. 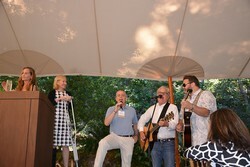 We were seranaded by Dave Duncan (Silver Oak Vineyards) and Jeff Gargiulo (Gargiulo Vineyards), with a song based on "Sweet Home Alabama," who with their wives chaired the Auction this year. All in attendance sang and danced along, happy to live and work in a valley they call home, where all care about one another. 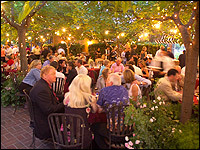 On the Wednesday night before Auction Napa Valley officially started, Wine Spectator held its 26th-annual exclusive Bring Your Own Magnum (BYOM) Party, at St. Helena's Tra Vigne restaurant. Delicious food prepared by Tra Vigne's talented chefs, fabulous wines donated by attendees, dancing to great pulsating music and, moreover, incredible people watching were the order of the evening. The over-1000 attendees included California winemakers, vineyard owners, UC Davis wine educators, and generous participants of Auction Napa Valley, such as Margrit Mondavi, Peter Mondavi and Mike Grgich. Ed and I were delighted to meet Wine Spectator owner Maurice Shanken, who was holding court there.